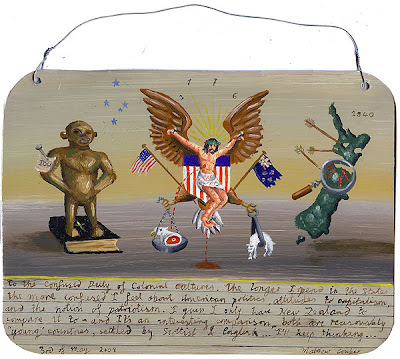 STAND CORRECTED - After looking for the original drawing of the crucified Christ on the USA seal in my sketchbook from 2006, I found text beside the drawing, written in at a later date - referring to the ex-voto below which over the last two years, I'd forgotten about. I painted the ex-voto while living in Las Vegas in May, 2008. The text below the image explains its 'motives'. It's never seen NZ soil as it is in stock at Corey-Helford Gallery in Culver City, LA at present. I'm looking forward to reuniting with it when we fly back there in July. This particular painting shows a valuable chain between the original sketch, the development of the notion in The Birth Of Death (mentioned in yesterday's post) and my 'keeper' retablo called The End Of The Beginning Of The End. To further its geneology, I started a grisaille, mirror-image version of the retablo on Monday - It's also a great way of maintaining sanity whilst shifting out of our home.